This NFL season has been full of surprises, some good and in the case of the Green Bay Packers some not so good. The Packers travel to Washington to start in the Prime Time Game this Sunday night, and they hope that the spot light will bring them better luck. The Packers find themselves in rare form having lost 3 consecutive games. Both teams are battling to advance to the post season this year, the Packers are in third place in the NFC North with a record of 4-5 making it very difficult for them to stay in the race, and the Redskins are also in third place in the NFC East with a record of 5-3-1 which means they still be in the race, they currently hold the 6th and final spot in the wildcard race, but if they lose to the Packers they might be knocked out. If the Packers lose this game, not only will they have lost 4 straight games, but you can bet head coach Mike McCarthy’s and a few others heads are sure to be on the chopping block. Green Bay needs to win this game at all costs, but can they? Before last week’s loss to the Titans, the one saving grace the Packers had was their run defense, going into week 10 they had one of the top run defenses in the league, but the Titans proved there are major flaws there as well. The Titans got 162 rush yards in their 47-25 win against the Packers. So, the only thing they have going for them now is the fact that they seem to shine a little brighter under the lights of Prime-Time TV. In the last six weeks, they have won both night games while losing 4-day time games. I agree this is not a good statistic, but heck I had to give them something. The Redskins dream of reaching the post season last year ended when they lost to the Green Bay Packers in the wildcard round, so in a sense this will feel like a revenge match for them, and they might just get it as it has become clear this year’s Green Bay team is not even a shadow of what it once was. Now that the weaknesses in their run defense have been exposed, I would bet good money on Kirk Cousins tearing the Packer’s defense to shreds. Check out the yards’ props at AceSportsbook.com and put money on Kirk Cousins throwing a minimum of 300 yards in this game and get at least 3 touchdowns. Another prop to look for is turnovers, even though Washington’s defense is nothing to write home about, against an inconsistent Green Bay offense they should be able to force at least 3 turnovers, one of these will be an interception thrown by Rodgers, the other two will be fumbles. 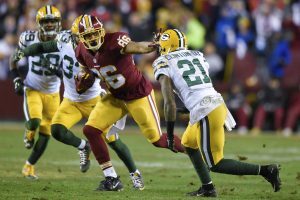 There is no doubt that the Redskins are playing better football at this point in the season and they will get their revenge win against the Packers this Sunday, effectively destroying Green Bay’s chance at a post season start.